The family of the limousine driver involved in a deadly crash in upstate New York says they believe he was unwittingly assigned an unsafe vehicle. The family of Scott Lisinicchia released a statement through their lawyer Tuesday asking the public to not jump to conclusions about the cause of the crash that killed 20 people Saturday. Investigators are trying to find out why the limousine ran through a stop sign at the bottom of a T-intersection on a rural road in Schoharie, 25 miles west of Albany. A lawyer for the limo company suggested the driver was unfamiliar with the roads. But the statement from the Lisinicchia family says they believe "that unbeknownst to him he was provided with a vehicle that was neither roadworthy nor safe for any of its occupants." 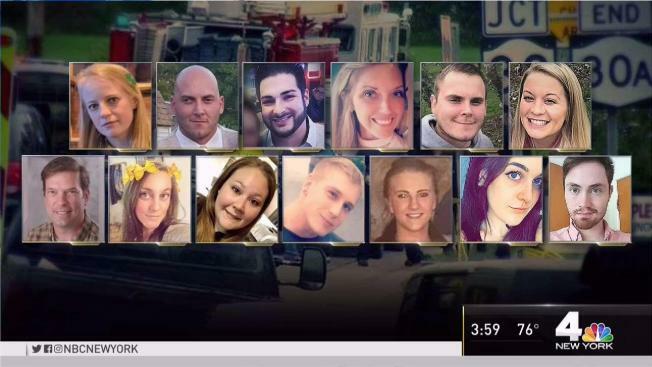 The family's statement came just minutes after New York State Police officially released the identities and hometowns of all 20 people killed in the crash. Investigators plan to examine the mangled limo's data recorders and mechanical systems as well as the road, which has a history as a danger spot. They are also looking into the driver's record and qualifications and conducting an autopsy to see if drugs or alcohol were factors. But officials already saw some red flags, Gov. Andrew Cuomo said: The driver didn't have the necessary commercial license, and the vehicle failed a state inspection that examined such things as the chassis, suspension and brakes. In an inspection on Sept. 4, the company's limos were cited for defective brakes, lack of proper emergency exits, flat or balding tires, defective windshield wipers, and other maintenance problems. His role at the FBI was assailed by civil liberties groups, who accused him of helping the FBI entrap people. Asked Monday about Hussain, the FBI wouldn't comment. He pleaded guilty to driver license fraud in 2003, the I-Team reported Monday. The crash appears to be the deadliest land-vehicle accident in the U.S. since a bus full of Texas nursing home patients fleeing 2005's Hurricane Rita caught fire, killing 23. Saturday's wreck was the nation's deadliest transportation accident of any kind since a 2009 plane crash near Buffalo, New York, killed 50 people.